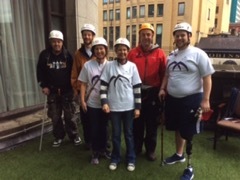 On the 12th November 2015 18 patients and Staff from Musgrave Park Hospital abseiled down the Europa Hotel as a Fundraiser for The MITRE Charity. BAC, Belfast Activity Centre provided all the training and equipment and supervision required for the Abseil. It was a drizzly morning when we all arrived for registration but brightened up for the event itself. There was much discussion as to whether limbs should be worn or not and for some folk getting onto the roof in the first place was a challenge in itself. One abseil rope was dedicated to the Amputees as it was felt they may need more attention than the rest of those taking part. In the end Gareth, the safety officer, said he was very impressed by how calm they all were and that there was more fear expressed by the non-amputees. David Radcliff was first down, to much cheering from his friends and family, followed by Kevin Cassidy, Timothy Shields, Louise Walker, Melvin Hunter, Robert Cross and Philip Glover. Alan Reese did a sterling job raising more funds among the spectators and passers-by on the pavement ! 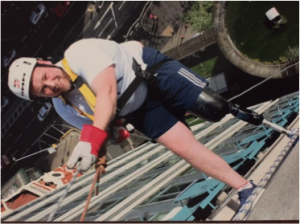 The Abseil raised a fabulous £6000 For MITRE which is a charity dedicated to improving patient experience and facilities in Musgrave Park Hospital. They recently donated £20,000 towards extending and refurbishing the Gym, corridors and patient waiting areas in RDS.